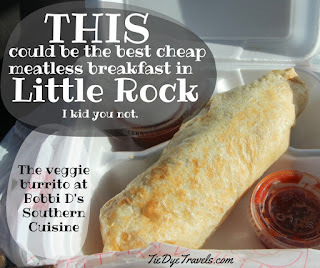 Quick Bite: The Veggie Burrito at Bobbi D's Southern Cuisine. 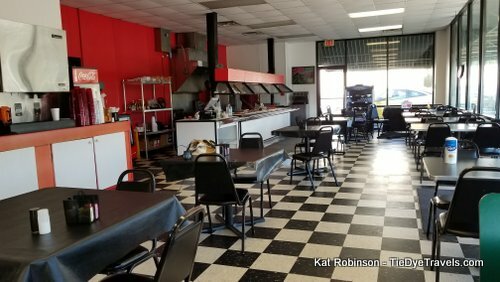 When you're on the run and want a quick, delicious breakfast that won't break the bank, Bobbi D's on 65th Street has the deal for you. Check this out. 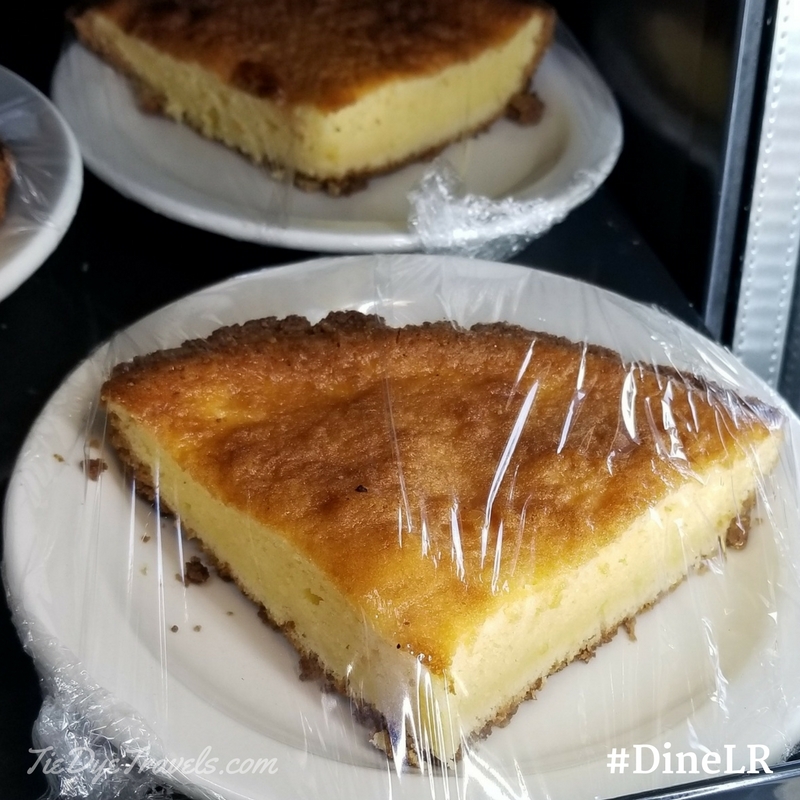 I stopped in Monday morning on my quest to try out all of the different places participating in Southwest and Airport week for Little Rock Restaurant Month - and because I was curious. I'd been to the location many times back when it was 65th Street Diner - it's about a mile from where I grew up and I had many a friend work in the area. I've been meaning to make it over, but like so many Little Rock stories, I've passed it up while working outside the city. Not this particular morning. I dropped in after Hunter went off to school. Somehow I'd missed the breakfast rush - which is a breakfast buffet of sorts. For $7.95, you can choose any three items off the buffet. That includes such things as sausage egg and cheese biscuits, pancakes, French toast, biscuits and gravy, all sorts of things. Problem was, I had come at the end of the breakfast rush and the buffet was being put away. For a moment I was concerned, since 65th Street Diner was infamous for turning off the lights and locking the doors between breakfast and lunch. Instead, I was welcomed to wait while a fresh breakfast was made. Since the single item that had drawn my curiosity while perusing the restaurant's Facebook page was the veggie burrito, I asked for that and coffee. I was rung up and left to my own devices. Did I mention I'd asked for coffee? Somehow, in the craziness that was Eclipse Day, I didn't caffeinate before leaving the house. Grav had left to head to southern Illinois to shoot the totality, Hunter had school, and I walked out of the house without a single cup. I stayed on my feet not because the restaurant had no patrons at that moment, but because I was asleep on my feet and needed to revive. I was given not a coffee mug but a large (maybe 24 ounce) Styrofoam cup and asked if I'd like anything in my coffee. Of course, I drink mine black. And I was... okay, restaurants can be hard presesed to keep coffee fresh when the customer rush is over, but this was really, really good and smooth coffee with just a hint of nutty flavor in the background. Yah buddy. I wandered over to the case at the end of the restaurant while my burrito was being sizzled up. Within I saw what appeared to be sweet potato pie, strawberry cheesecake and - is this chess pie? Aaah. I needed more caffeine but I made a note to return for at least one of these big slices. It took a few minutes, but my veggie burrito was being made from scratch. I was stunned when it was delivered - it was hard for the lovely lady who'd waited on me to get the top of the box closed. Armed with salsa (she said it always came with it) and sour cream, I took off on my adventure. But I did stop and have a few bites before I wandered on. 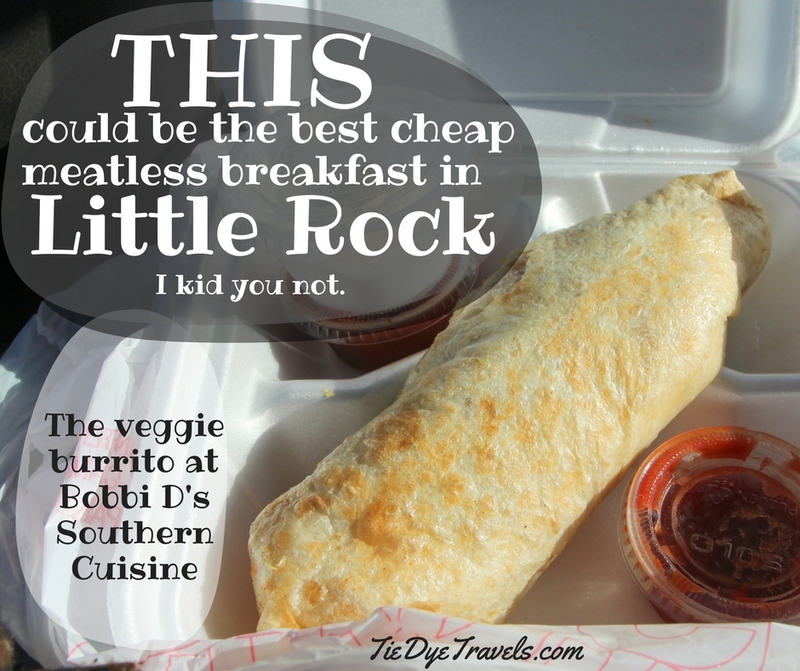 And that's where I realized, I had in my sack one of Little Rock's great breakfast secrets. See, lots of places do a veggie mix or just throw whatever into their meatless omelets. Here, the onions had been sauteed until they were not just translucent but bordering on beautiful caramelization, alongside slivers of green bell pepper and sliced mushrooms. The trio had come together superbly. The eggs had been started after the vegetables, which meant they weren't rubbery like the ones you get at fast food restaurants. The cheese was almost an afterthought and didn't draw away from the other flavors at all. The bigger secret? This big honking burrito and a big cup of joe cost all of $5.45. So there you go. 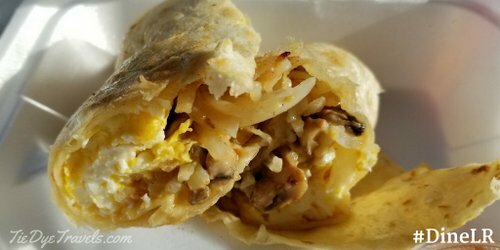 The veggie burrito is a staple on the breakfast buffet and it's larger than what you really need for breakfast on your own - think about that buffet with a couple other items. That's a handsomely large repast, right there. 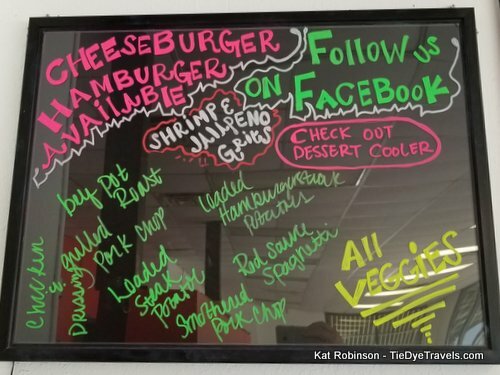 You'll find Bobbi D's Southern Cuisine at the east end of 65th Street, couple of blocks west on the south side of the thoroughfare. It's open 6:30 a.m. to 2 p.m. Monday through Friday and 11 a.m. to 3 p.m. on Sunday. Call (501) 565-1699 or check out the Facebook page for the latest special. NOTE: Yes, this was where 65th Street Diner was located - and before that, Bobby's Country Cookin'.